You can get clue into other issues in query. 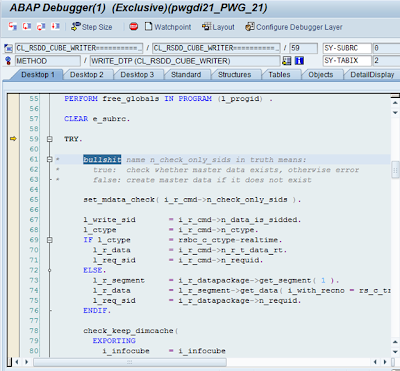 If this is still not enouigh you need to check ABAP report in BW’s back end RSR_BAD_CODING. However this ABAP report can be consistent – w/o syntax error and you still not solved your query issue. Here is another tool which may help – TA RSRTQ Query Definition. Finally you go to QD again and in this case you switch to table view display and you find problem nous formula in respective row and columns in Cell definition. To be more concrete in the book there is a link provided to one of my blog post. It is a post related to miniSAP – where to download it. This post is the most visited post in my blog ever. I perceive quote to blog in the book as an honur counting the fact that there is numerous of other blogs relate to miniSAP out there on internet. Some time ago I wrote short post about possible differences between TAs: RSRT, RSRT1, RSRT2. The fact is that they all 3 three are linked to same ABAP program: SAPMRRI1. Only visible difference is that RSRT1 has additional input field for Query view ~ meaning you can run Query view via this TA w/o using BEx Query Analyzer. So that’s all what is remarkable at first sight. But real differences are hidden undercover. Basically TA RSRT2 is intended to be used by SAP support people while solving customer issues. 1. There is a possibility to execute query in special mode so called safe mode: button Execute + Debug -> Execute in Safe Mode. Running query in this mode system deactivates all optimizations for query execution. E.g. if your query shows correct figures in safe mode then you can be sure that there is no error caused by OLAP engine but by some other component. 2. Mode: Execute and Declare (in BW 73 called as Execute and Explain). Using this option you can see additional log in several areas (see below) after query execution. This can indicate cause of other problem that you might face in your query. If you ever worked for SAP upgrade project you probably already came across to this term – shadow system or instance and system switch. What is that? Let me first introduce background of upgrades. Basically by upgrade we want to get the newest functions that provider offers in its software product that we are currently using. For sure we want to get this done without an interruption to existing, running system. In reality there is always some interruption. We are just trying to minimize it as much as possible. So does the SAP. The background of shadow system is to minimize system downtime during the upgrade. Shadow system is basically copy of system that is going to be upgraded. This copies system is a bit limited to original one. It has only technical repository (SAP Basis objects) of objects and you cannot run your business processes on it. More over technical repository is upgraded into version of final release of to be upgraded system. Technically speaking it is used for modification adjustments (famous transactions SPAU and SPDD) and activation of objects. All the support packages and add-ons are imported into this instance as well. By them you get you system to the higher release. Let me mention also that shadow system run in the same database as its original system. They are running in parallel. During preparation of shadow instance you are still running your original SAP system where all the business processes are being executed normally. At the moment when shadow instance is prepared we do its switch from shadow to original system. This is called system switch when you kind of “exchange” original system with shadow one. By that time shadow system becomes upgraded system. By using this approach you can minimize downtime of your production system and also you do not have to have additional hardware resource for creation of shadow instance as it runs in the same database and application server as original system. Notice that a matter of SAP system is very complex all the information provided can serve as very brief introduction into this topic. I wish you a lot of successful upgrade projects. 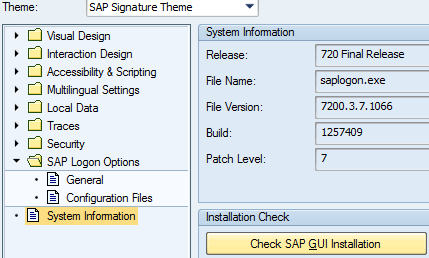 I had to reinstall my SAP GUI recently and during this process I encounter few issues. Within this post I want to share GUI installation troubleshooting hints. My version was SAP GUI 7.2 Compilation no. 3. Notice that installation of GUI requires administration right on user performing installation itself. This is must w/o it installation will abort. From disk size point of view you need at least 1,5GB left on hard drive where software will be installed. · BEx tools – BEx Query Designer, BEx Query Analyzer, Web Application Designer, etc. Also you will be required to install Microsoft .NET Framework 2.0 Service Pack 1. For BW 7.x frontend tools you will need 3.5 framework or 4.0 framework. SAP frontend software installation has encountered a problem and needs to close. We are sorry for the inconvenience. From now on you are guided through installation via standard installation windows e.g. asking for target folder, selection of GUI’s components etc. 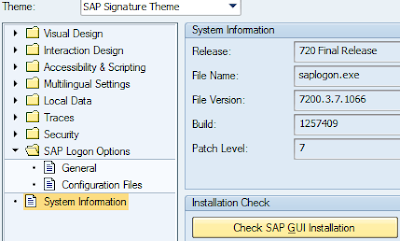 · SAP GUI - where to download it? · When your SAP GUI will die?